What makes a landing page that creates response and profits? Your leads have opened your mail (email or print) or clicked your Facebook ad. And now, instead of being intrigued, they’re bored stiff or confused — or just annoyed. Whether you spend thousands of dollars for a remarkable direct mail package or a few bucks for a pay-per-click banner ad, you don’t want to waste a dime. But having an ineffective landing page could kill your whole marketing campaign. So…how do you create an excellent landing page? #1: No navigation distractions. Don’t distract your website visitors with multiple options. Your goal is to keep them on your page…not to allow them to click away to something else. #2: A strong, powerful, benefit-oriented headline that corresponds to the message that brought the visitor. One example of a great headline we used for a precious metals and investment client is How to protect and grow your money in the inflationary times ahead. #3: A strong call to action (CTA) should be included in the sidebar in the upper-right corner of the desktop, and at the top for the mobile page. #4: Enough copy to reinforce the first message from the email, web ad, direct mail or whatever drove them to the landing page. #5: Use of direct response copy and direct response art. Using direct response copy and art will ensure that you make a sale – not just impress visitors with cute copy or beautiful graphics. #6: An efficient, 1- or 2-step process for the shopping cart. Making a purchase should be fast and easy. Otherwise, you’ll lose potential buyers. #7: Copy and graphics, testimonials or video examples reinforcing benefits you offer to buyers, often on the right side of the page. Never, never drive the prospect to your main corporate website—or violate any of these 7 tactics. An effective direct response landing page I created for one client. “Super Food Weight Loss Accelerator” is an alternative health product that is extremely effective in helping clients reach optimum health and weight levels. On the mobile landing page that we created for them, distractions are non-existent. 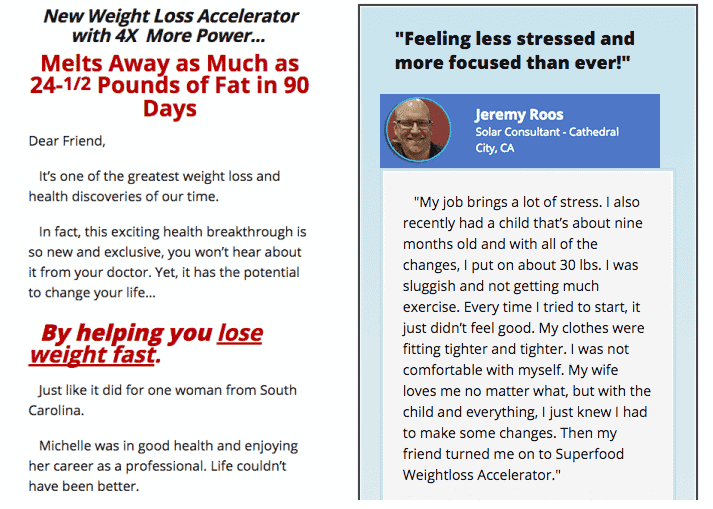 Plus, you can see that we have a strong headline: New Weight Loss Accelerator with 4X More Power…Melts Away as Much as 24 ½ Pounds of Fat in 90 Days. Also, notice the use of convincing direct response copy. It’s unique in that it uses persuasive adjectives and strong verbs. To accentuate important points, applying boldface or color (we used red in this example) to type brings that out and speaks directly to readers – especially those who might skim copy looking for summary information. The landing page also includes enough copy to reinforce the first message, as well as testimonials from satisfied customers with photos to strengthen their words. To find out more about what makes a good direct marketing landing page, watch this short video (it’s less than 3 minutes). If you would like to talk to me about creating a strong, sales-boosting landing page, call me at (310) 212-5727 or email Caleb at caleb@cdmginc.com.